Whether it’s a hurricane, earthquake, tornado or wildfire, none of us are immune to natural disasters. One of the best, most empowering things to do? Prepare! Disney takes on a campaign with the Red Cross targeted at school-aged children centered on a common household item: the pillowcase. 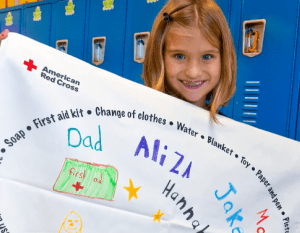 The program, which is taught to 3rd – 5th graders in schools, after-school programs and summer camps, teaches students how to create their own emergency supply kit by packing essential items in a pillowcase for easy transport during an emergency. Students also have the opportunity to decorate and personalize their pillowcases. The program is sponsored by The Walt Disney Company.